In Nature's most beautiful hues, may be seen. 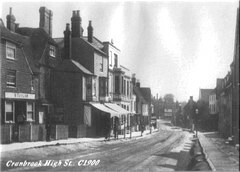 Cranbrook had a population of about 3000; it was 2994 in the 1811 census and much larger than the surrounding parishes: Goudhurst 2082, Hawkhurst 1849, Benenden 1322, Biddenden 1278, and Frittenden 593. The town of Cranbrook ... consists of one large wide street, of about a mile in length, having the church nearly in the centre of it. There is but a very small part of it paved, from the market-place eastward (now Stone St), which was begun in 1654, being done through mere necessity; the mire of the soil before, being not only a great hindrance to the standing of the market people, but to the passing of all travellers in general. The market is still held on a Saturday, for corn and hops, and is a very plentiful one for meat and other provisions. And there are two fairs held yearly, on May 30th, and September 29th, for horned cattle, horses, linen drapery, toys, &c. but the latter is the largest, at which there is a great deal of business done in the hop trade. 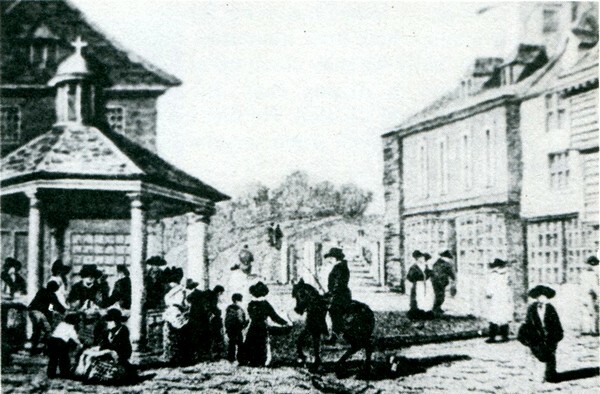 The fairs were held in the Ball Field to the north of St.Dunstan's parish church. In 1814, these were principally for the local farmers, although later in the century, a pleasure fair became increasingly popular. The principal inns in the centre of the town were the George, the Bull, and the White Lion. In the period 1730-50, there had been 17 or 18 licensed premises in the whole parish, but, due to later tightening up of the licensing laws, this number had decreased to only eight by 1814. At this time most country towns had independent banks set up by local gentry and businessmen and their financial viablility was not always sound. 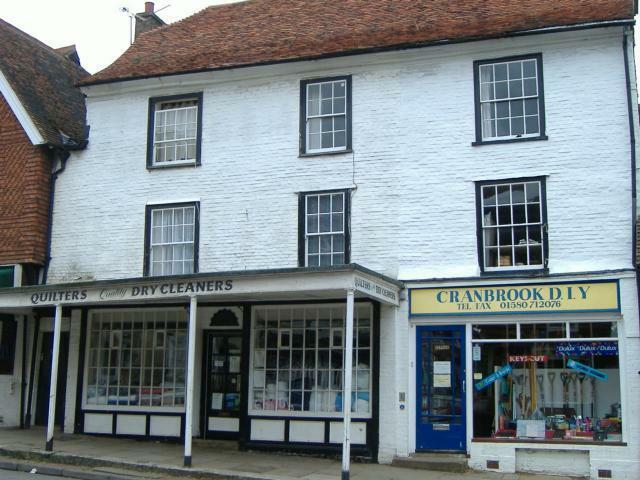 The Maidstone bankers, Bishop & Co., purchased the Weald of Kent Bank in Cranbrook for £800 in 1813; it occupied the building now known as Quilters Dry Cleaners. The active partner, Argles Bishop, (others had financial stakes), was a distiller in Maidstone and operated a wine & spirit business from one half of the Cranbrook building and the bank occupied the other half, so the bank was only a small part of his total business interests. His principal enterprise, a distillery which produced Maidstone Gin, went bankrupt shortly after, and this had a knock-on effect. His debts were such that the partnership went bankrupt, and the bank in Cranbrook had to close. It was open on Saturday, September 10, 1814, but it was unable to meet all the cash demands made on it that day and bankruptcy was declared on October 8th. The main road from Maidstone through Cranbrook to the northern boundary of Hawkhurst parish had been turnpiked in 1760. The Flower of Kent stage coach, starting in Tenterden, called at the George Inn in Cranbrook and took passengers to the Bell in Maidstone, continuing on to the George Inn, Borough. Travelling on the "outside" was cheaper, if you could keep your balance on the roof (see picture), but the better view of the scenery might well be dampened by the weather. Even with the improved roads, the journey to London took the best part of a day so the coach left the George at 10am on Sunday, Tuesday, and Thursday each week, returning on the following days. Fares: 12shillings (60p) inside, 7shillings (35p) outside. Vans (short for caravans) carried people and goods and were cheaper but slower. 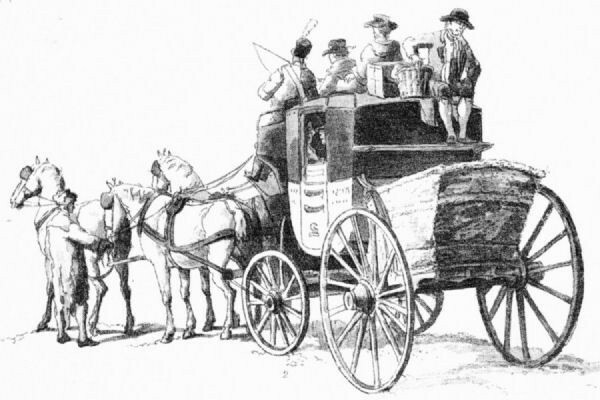 Carriers' wagons brought goods from London and other towns to Cranbrook and took produce out of the Weald. 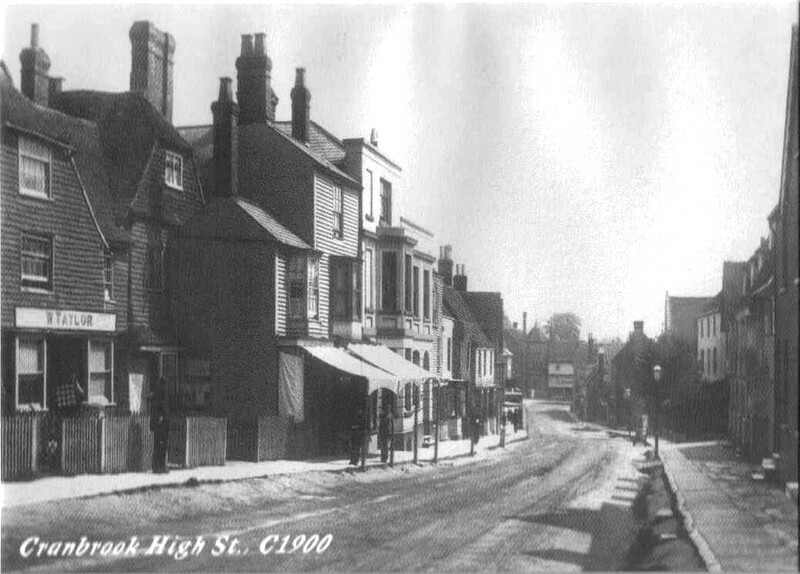 Several carriers from neighbouring parishes passed through Cranbrook, usually stopping at the George, the Bull, or the White Lion..
To the neighbouring Parishes, goods to convey. 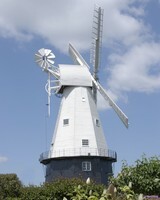 Cranbrook with its small streams had several watermills and most millers operated a windmill in conjunction with one. By 1814, there were four watermills working in Cranbrook parish and a fifth at Hammer Mill, just over the parish boundary, in Biddenden. There were three windmills in operation, all built during the War with France, the last to be built being Dobell's Mill, now known as the Union Mill. Typical of most small market towns, there was a wide variety of trades exercised in Cranbrook. In addition, to the usual array of shops, there were blacksmiths, shoemakers, tailors, dressmakers, bakers and even a gingerbread maker. There was a ropemaker and a tanyard, with the associated leather trades making saddles and horse harness, as well as boots and shoes.